What car is so awesome you'd even drive it in hot pink? So, imagine you can have any car you want — just name it. The only stipulation is it has to be repainted in the color of day-glo love. What car is so awesome you'd even drive it in hot pink? Thanks to GT Spirit, my mind is made up. It'd be the R35 Nissan GT-R. Somehow that post-modern techno anime body style gets a little positive softening in pink. 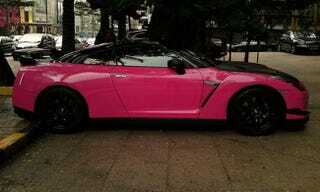 Then again, I'd probably take a GT-R in any color, including Marshmallow Peeps puke. What about you? Share a photo if one exists.